Martinique has a colorful and sorted past which influenced the whole Caribbean. Christopher Columbus discovered the island in 1502 giving it the Carib name Madinina, the Island of Flowers. The French arrived in 1635 but were put off by the fer-de-lance snakes, reputed to be allies of the native Caribs. In 1676, after many attempts by the British and Dutch to conquer Martinique, it was made part of the kingdom of France. In 1762, the British finally conquered the island. However, in 1763, the Treaty of Paris was drawn up which stated that France had to give up Canada, 'a few acres of snow' to get back the Isle of Flowers. In 1794 the English once again returned. 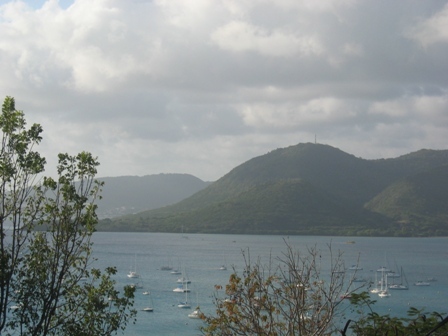 Napoléon recovered the island in 1802, the same year he became acquainted with Joséphine, in order to re-establish slavery as he did in Guadeloupe. A second Treaty of Paris was drawn up in 1814 definitively returning Martinique to France. By end of the 17th century, sugar cane cultivation had increased significantly, and the "need" for importing African slaves grew considerably. By the end of the 18th century the majority of the population had come from Africa. 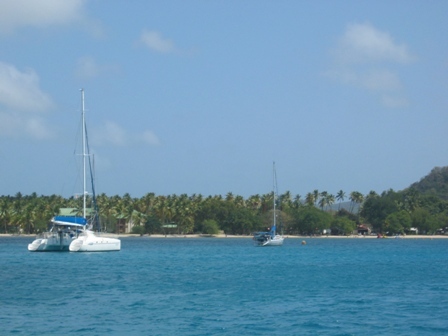 The main languages spoken today are French and Creole and the population of the 1,000 sq meter island is about 414,000. The currency here is the Euro. I was very excited to get back to "France" to finally get good bread and cheese. The channel entering Le Marin.
. Our first night in Martinique Dalliance and Lena anchored off of Le Marin and checked into customs. To get to Le Marin you have to pay close attention and follow the well marked channel because there are coral reefs just outside the channel. Well, that evening Jonas and Ylva came to Dalliance for a BBQ and we were all sitting in the cockpit when Marco noticed this red light (it was very ark out), streaking across the bay. It actually looked like someone was pointing a laser beam and moving it. After we all were watching this, all of a sudden the red light (a boat) suddenly stopped. The driver of the boat had hit a reef going full speed. Marco and Jonas put on their Superman outfits and jumped in the dingy and saved the day!!! The driver was very lucky and did not appear injured. Marco and Jonas were then able to push and pull on the craft until it came loose. Our heroes!!! The anchorage from the hill in St Anne. 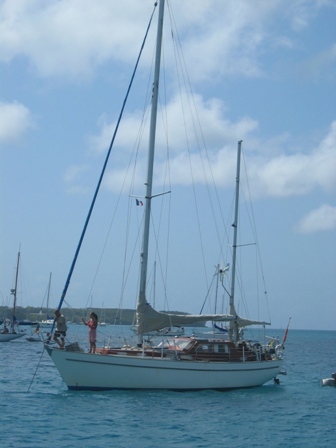 After the exciting night in the anchorage in Le Marin, Dalliance and Lena moved just down the bay to this anchorage, St. Anne. At the end of the beach was a Club Med that Marco and Jonas wanted to crash at night. They behaved themselves and did not do a commando mission. The Club Med des Boucaniers (the Buccaneers) beach at St. Anne. 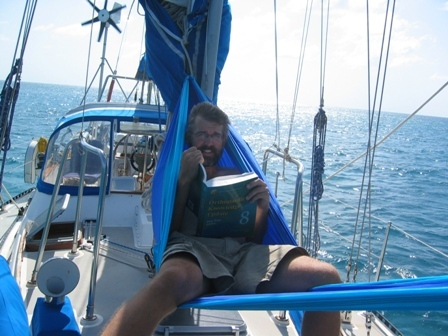 Jonas and Ylva aboard S/V Lena anchored next door to Dalliance. 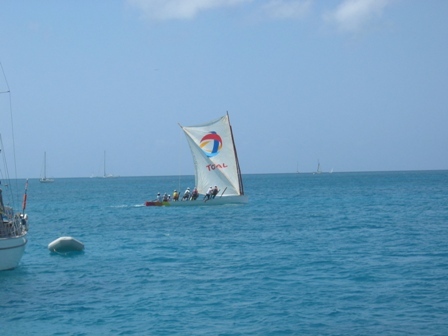 The local Yole boats are fun to watch, as they are of light construction with a huge sail area. 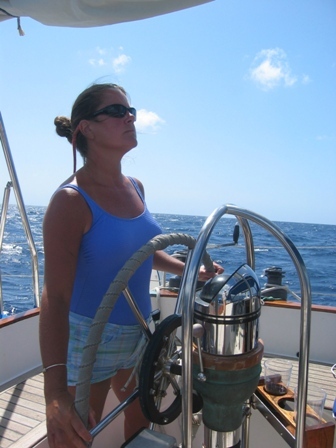 With each wind gust, the crew has to scramble to hike out on the boards secured to the hull, to keep the boat from capsizing. Marco keeping up with the latest in orthopedics. Marco has to take his Orthopeadic recertification exam at the end of April and has been diligently studying since October for it. Ylva and Jonas on the town dock in St. Anne. 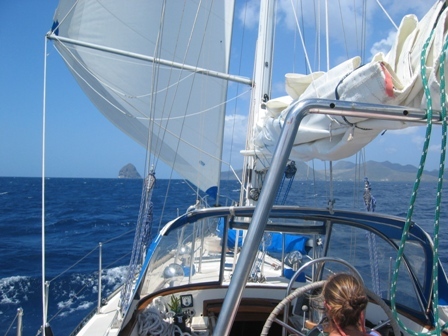 Approaching Diamond Rock on our way to Fort de France and Trois Islets anchorage. 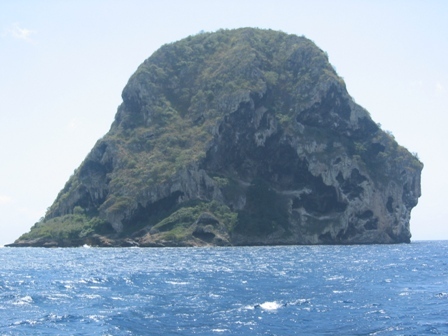 Diamond rock is a small island with steep cliffs that played an important part in the Anglo-French wars. 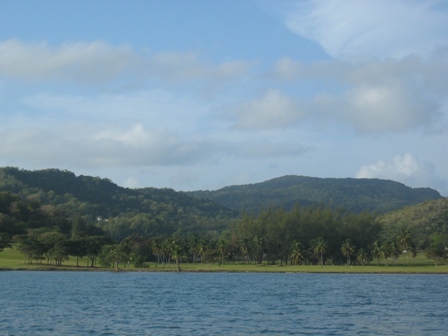 In 1804, the English placed four cannons and about twenty soldiers here to control the sea approaches to Martinique. For eighteen months the island was an impenetrable fortress battering French shipping to Fort de France. In light of its success the rock was elevated to the status of a naval ship, and was known as HMS Diamond Rock. Robert Trent Jones designed golf course as seen from our anchorage in Trois Islets. 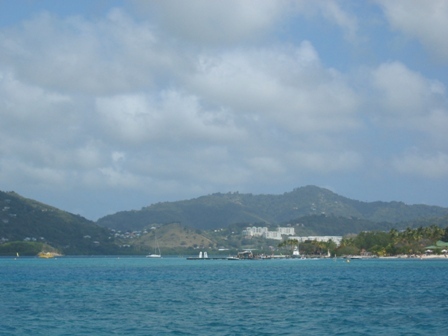 It is said that this is the only place in the Caribbean that you can anchor off a golf course. 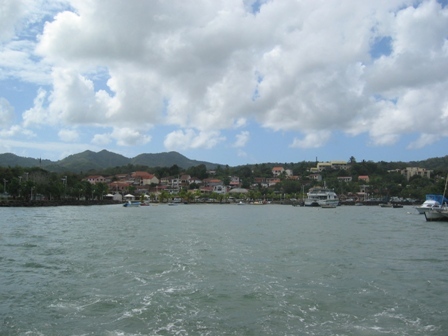 Leaving the port of Trois Islets by ferry on our way to visit Fort de France. 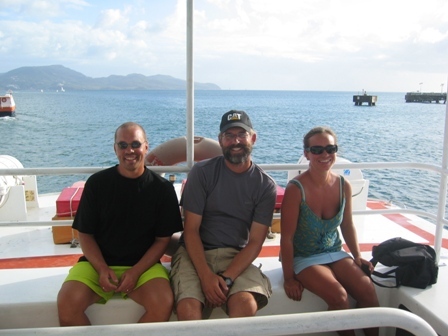 Enjoying the ferry boat ride to Fort de France. Sometimes it is nice to ride on someone else's boat. 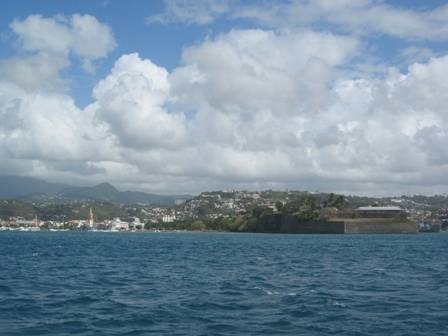 The city of Fort de France, where nearly one-third of the population of Martinique lives. Fort St. Louis can be seen on the right protecting the harbor. Once in the city the boys and girls split up do shop. Jonas and Marco headed straight for the chandlery and Ylva and I set up the find some Paris fashions. It was nice here that you could clear customs right in the chandlery. On our way north to Dominica, we passed by St. Pierre, which was Martinique's first city and trade center until it was wiped out in 1902 by an eruption of Mont Pelée. This disaster caused 30,000 deaths, and killed the majority of the European population on the island. The entire social and economic situation was changed on Martinique by this single event. 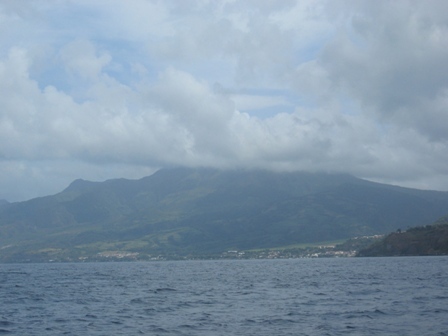 As were leaving Martinique we realized that this was the last Windward Island and that Dominica would be the first Leeward Island.